The entire south-central portion of Washington consists of a relatively low but rolling plateau bordered by higher plateaus and mountain ranges (Cascades to the west, Okanogan Highlands to the north, Rocky Mountains to the east and Blue Mountains to the southeast). The southern border of the state forms the southern Washington border of this extensive region, which extends through large parts of eastern Oregon and southern Idaho. The Columbia Plateau is the lowest region east of the Cascades in Washington, relatively flat but gently rolling in many parts. The plateau tilts generally upward from south to north, with a typical elevation range of about 500-2,500 feet (extremes 100-4,200 feet). Basalt underlies the plateau, deposited from repeated lava flows 17 to 6 million years ago. The huge floods caused when the Lake Missoula ice dams broke removed the soil from large areas and formed many of the plateau's existing features, including the parallel gouges of the Channeled Scablands. Finally, glaciers covered the northern part of the ecoregion, south to the Waterville and Omak areas. Now the plateau shows exposed rock everywhere, with many low cliffs, some large canyons ("coulees"), and many lakes. Low, rolling hills covered with volcanic loess soils overlie much of the eastern edge of the ecoregion in Whitman County and adjacent Idaho, a region known as the Palouse. The Columbia River and its major tributaries, the Yakima and the Snake, drain it all. Moisture from the Pacific Ocean is largely drained from the prevailing westerly winds, producing an extensive interior rain shadow. Thus this is the hottest and driest part of the state, with less than 10 inches of annual precipitation in the driest localities and less than 15 inches generally, highest around the edges. Summers are very hot and dry, with temperatures occasionally reaching 100 degrees F, but winters are cold and cloudy. Precipitation usually falls as rain, but at intervals snow may blanket the entire region. However, in most years it does not persist throughout the winter at the lower elevations. Two major habitats occupy this ecoregion, true steppe (grassland) along the northeastern and eastern borders and shrub-steppe over the remainder. Much of the steppe corresponds to the Palouse region of loess soils. Bunchgrasses dominate, but other grasses and many forbs occur, some of them producing spectacular spring wildflower shows. 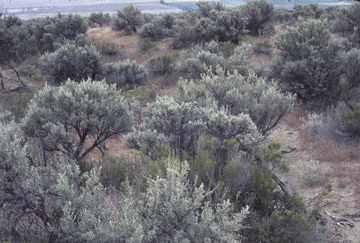 The dominant shrub-steppe plant is big sagebrush, but other arid-land shrubs such as bitterbrush and greasewood are dominant in appropriate soils. Grasses and forbs of many kinds occur among the shrubs, many of the plant species the same as those of the grasslands. Desert parsleys and buckwheats are both abundant and diverse. Soil types range from pure sand to a thin film over lava rock, plant species varying accordingly; for example, three-tip sagebrush dominates on rock outcrops. In moist canyons and scattered hills with higher rainfall, limited stands of ponderosa pine and Douglas-fir occur, and along rivers and streams, borders of riparian woodland include black cottonwood and peachleaf willow, with occasional stands of quaking aspen in seepage areas. Dense shrub thickets (rose, sumac, currant) may also occur in these situations. Alkaline and highly productive wetlands, mostly lakes and ponds but many with extensive marshes, are numerous in the Channeled Scablands and scattered elsewhere, and the large rivers form important migratory corridors for water birds. Although cities and towns are small and scattered, well over half of the region has been altered through agriculture. The presence of the Snake and Columbia Rivers, with their associated dams, has allowed redistribution of water through many parts of the region, with enormous changes to regional ecosystems. Water can be pumped or delivered downstream from huge reservoirs-Banks Lake, Potholes Reservoir, and Scooteney Reservoir-to provide many parts of the ecoregion with irrigation water, allowing large-scale agricultural development for a great variety of crops. Rising water tables from irrigation have produced more wetlands in recent years. The slightly moister Palouse grasslands have been almost entirely transformed to dryland wheat. Still other grassland areas have been planted in pasture grasses to produce hay and straw. Grazing and introduced weedy herbs have severely compromised the integrity of most of the remaining stands of sagebrush and grassland.